This summer, I had a brief lull between major events in the life of my family. That lull neatly corresponded with Tour de Fleece, so I spun and spun and spun, ending up with more finished yarn than during any previous Tour. I was especially excited about the pound of Hello Yarn “Gobbler” on Cheviot. A wooly wool similar to Shetland, this was a delight to spin. I spun it with a sweater in mind, thinking these colors would be absolutely perfect for fall. I cast on during my family’s staycation in mid-August. The following week, I knit my little heart out in the waiting area while my husband had surgery. In June, my husband was diagnosed with moderately aggressive prostate cancer. The diagnosis was scary and the surgery to remove it was major, but everything went very well and his prognosis is excellent. The pathology report indicated that the cancer was confined to the prostate and that the surgery got it all. But before we got to that point, the summer was fraught with worry. My knitting was a good companion during the time of waiting; this sweater has a lot of hope stitched into it. I wanted a sweater pattern that was simple, slouchy, and textured. The Laurie pattern looked like it would fit the bill, and mostly, it did. I love the wide neck, and the intriguing sweater construction. After the neck, the knitting is just round and round, with the tiniest bit of texture to keep things interesting. One of the things that drew me to the pattern was its shape – a little slouchy, a little boxy. But that’s also what kept it from being totally perfect. Because once I finished and put it on, it looked too boxy. There’s a whole bunch of weird extra fabric in the back (almost like wings), and no way to fix that by taking in the sides because it’s seamless. 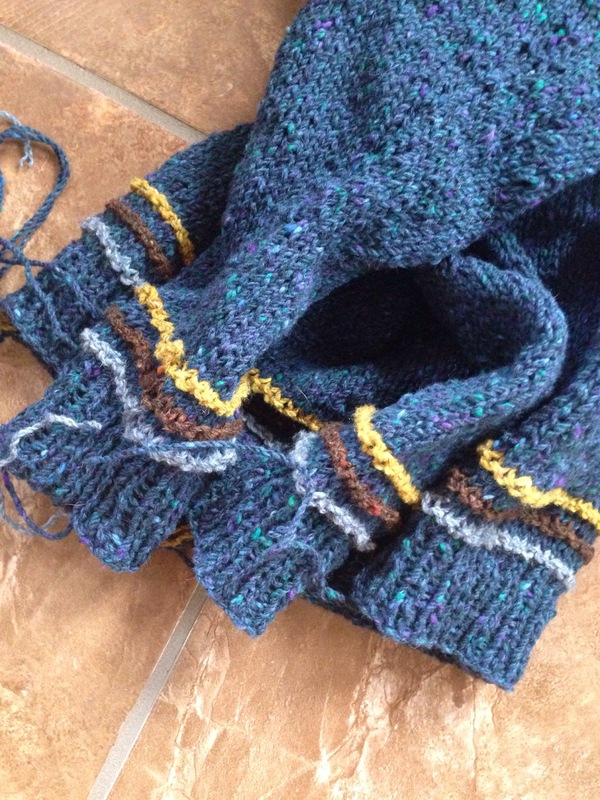 At first, I thought the problem was with my execution – perhaps I picked a size too large, or maybe it was the fact that I was knitting with a heavier weight of yarn (worsted as opposed to DK, with my stitch count adjusted for my gauge). But the more I studied the pattern photos and pictures other people have posted of their sweater, the more I realized that, no, it’s a feature of the sweater. Everyone seems to pose their way around it – with arms crossed, or hands on hips holding the sweater in closer, for instance – but if you look more closely, you will see the extra fabric in the back on some pictures. At first I was pretty disappointed. It was a lot of knitting (not to mention spinning) to end up looking like a blob. Blobbiness emphasized by horizontal stripes! But my husband has convinced me that it looks better than I thought, and that not everything has to be the most flattering things I’ve ever worn. I can always rip back to the armpits and decrease several stitches at the bust, to see if that helps. But for now, I’m going to keep wearing it as is. Because it is so comfortable, and so cozy, and the colors are so yummy. 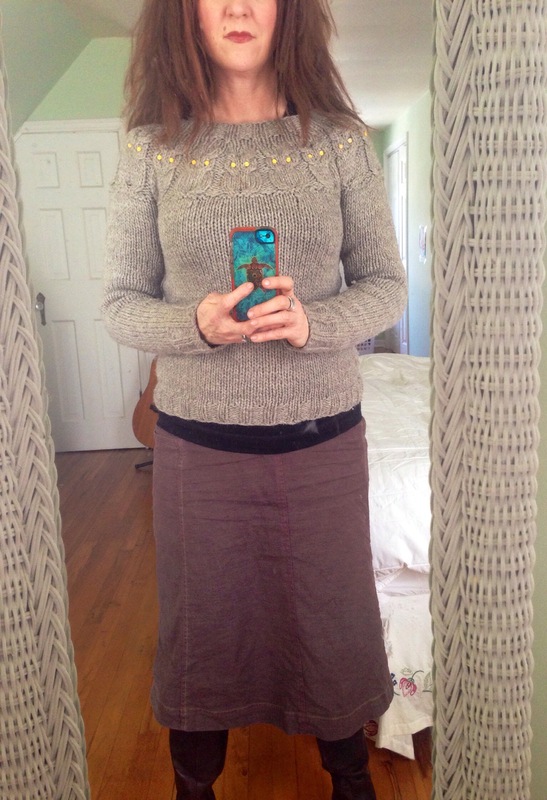 I wore it to Rhinebeck, so it also reminds me of super-happy times with a sisterhood of knitters. It’s not everything I wanted it to be, but it’s almost everything. And it’s basically almost perfect. And for now, that’s good enough. At last, on the cusp of winter, I have finished knitting my autumn sweater. As I mentioned, I kind of knit the yoke intuitively, using the pattern more as a suggestion than as actual instructions. Others who have knit this sweater mentioned that they didn’t care for the fit of the neck as written, so I knew I was going to modify that part. But I also ended up modifying the height of each strip band of color. Also, my gauge was somewhat different than the pattern gauge, so all my numbers for the stitches in this sweater were different than the pattern called for. I managed to not keep a single note about that, though, so by the time I got to the yoke, I didn’t really know what my numbers should be anymore. So that’s why I just let my intuition guide me. Actually, I suppose I could’ve gone back and counted up the stitches of the body and arms, to see what I had come up with when I cast on, way back in July, and then make some calculations to see what I needed to do. But I was in such a good zen-like flow with this sweater, that I preferred to just do what felt right. The fit of this sweater currently is so perfect as it is that I’m a little worried about blocking it. The last time I blocked a perfectly fitting sweater, it never did fit quite right again. Not blocking it isn’t an option though. As you can see, it needs the finishing that only blocking can provide. Do you think a spritz blocking would do? Meaning, if I spritz block, would that give it a good finish without risking making it bigger than intended? I think I am about 3-5 rounds from being done (I’ve been winging the yoke, so it’s hard to say for sure). I think I can be a monogamous knitter for that long. I am fully obsessed with working on my handspun pi shawl, which is a problem, since I really, really want to finish up my sweater. Solution? I’ve made a reward system out of it. 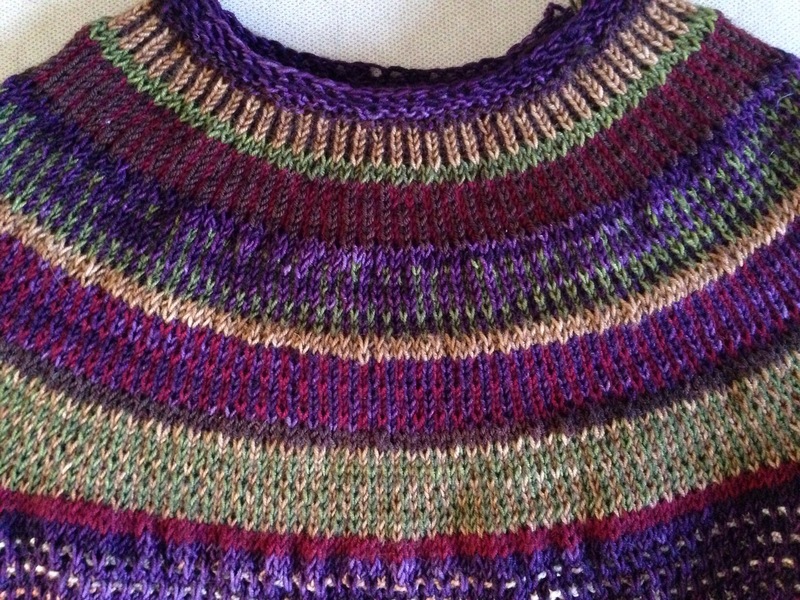 Knit a round of my sweater yoke, spend a few (okay, several) minutes on the shawl. 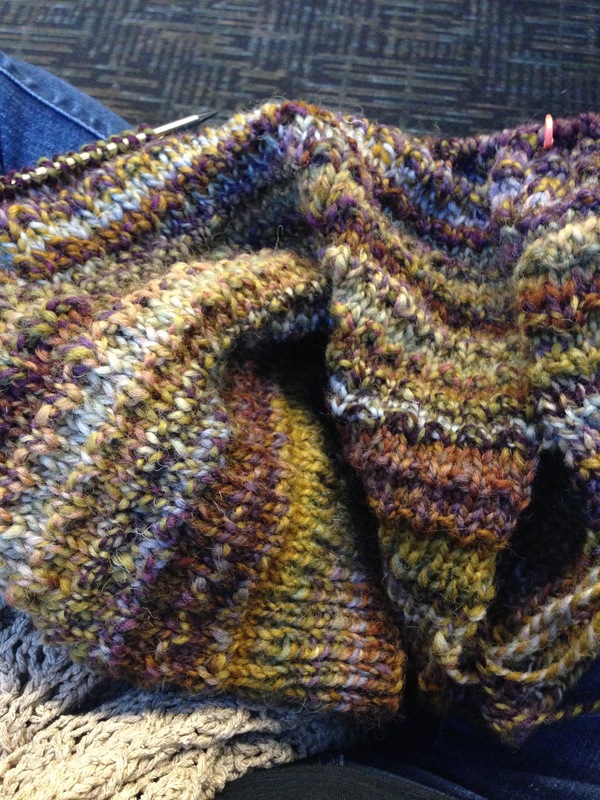 (exception: I don’t have to earn time knitting on the shawl while out-and-about – the shawl makes much better on-the-go knitting than the sweater does). Is it sad that I have to make these kinds of deals with myself? Perhaps. But whatever works, right? Plus, knitting as a reward for knitting? YES, PLEASE. Once upon a time, I could bang out a sweater in a matter of weeks. 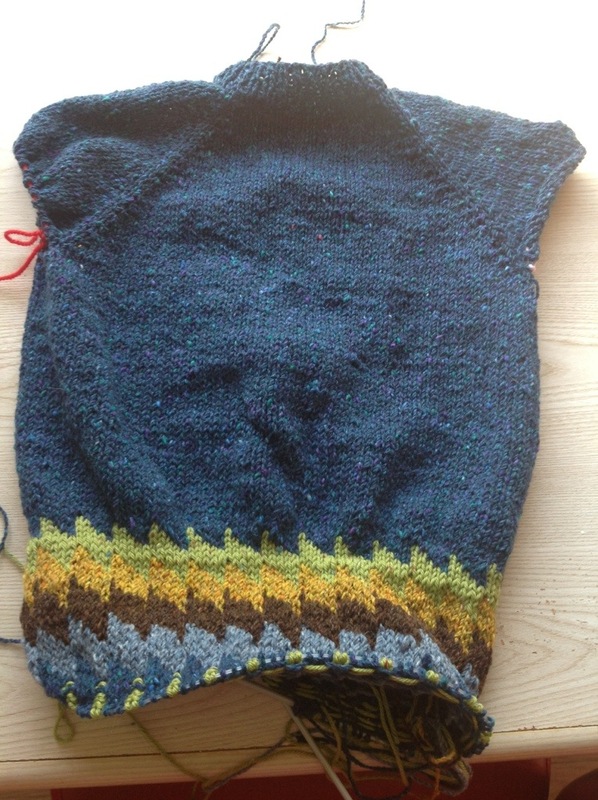 Or even days – I was shocked to discover that five years ago, I knit my Owls sweater in nine days! Now it seems to take me months to finish a single pullover. Of course, I suppose that’s what I get for choosing to knit a colorwork sweater out of sock yarn. 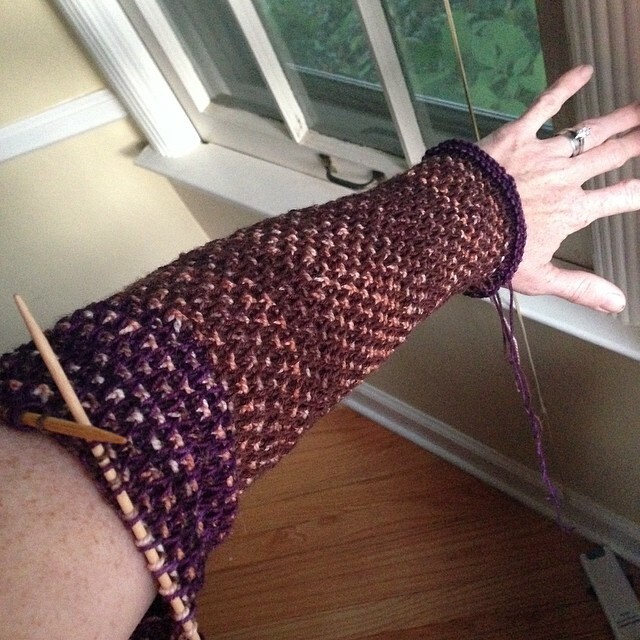 This summer, I became completely obsessed with a pattern based on a single blog post. Check out this amazing sweater on February Twelve. But be warned – you might fall in love with it, too, and decide you have to knit one. Right. This. Minute. That’s what happened to me. Her version completely captivated me and I knew I couldn’t rest till I cast on. So I gathered up a mighty collection of stash yarn, and went to work. I got a few inches in and realized it was coming out bigger than expected and I was knitting it with the variegated yarn dominant rather than the solid, which is what I meant. So I ripped it out and started again, while in Georgia on vacation, towards the end of July. 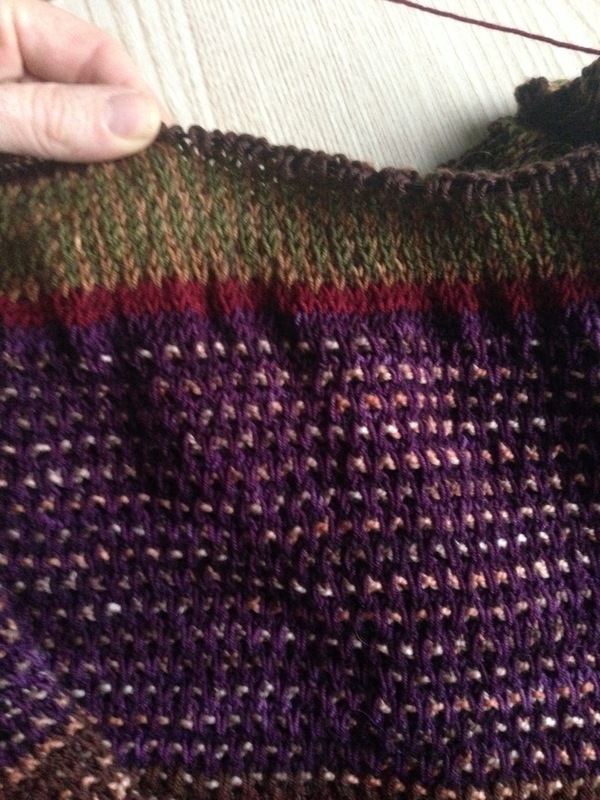 The pattern, Reis by Stephen West, is a really fun approach to colorwork. It involves slipping stitches (i.e., no carrying multiple colors on one round) for the body and then switches to very modest strandwork in the yoke. But y’all. It is taking me FOREVER. Then some other things took my focus (namely, my Crackerjack, plus a pile of spinning). I am trying to forget all my other knitting plans for now and just focus on getting this done and enjoying the process. Because it has been a beautiful process. It is mostly Plucky Knitter yarn, which is just a joy to knit. And the colors are perfectly in sync with autumn and with my love for autumn. 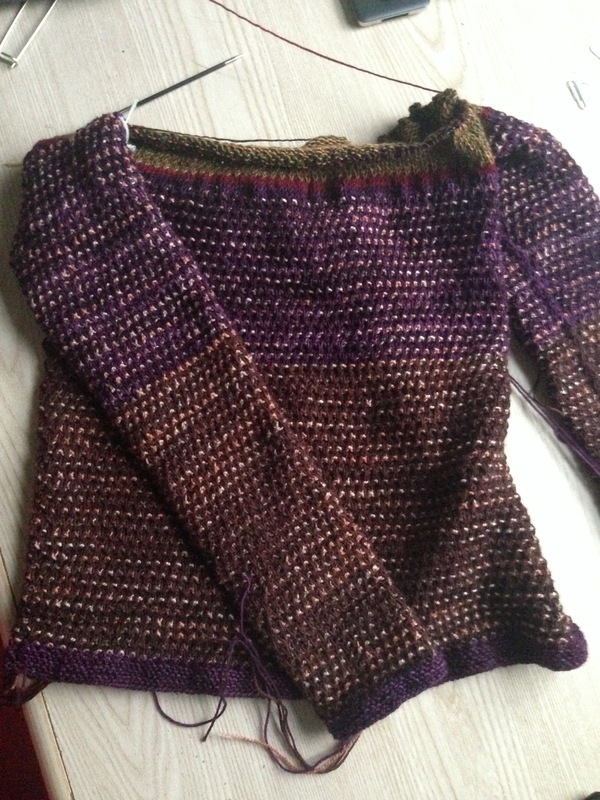 Perhaps I will even finish it in time to wear it before autumn is done? Whoo-whoo wears wool in spring? But if you’re going to have to wear your winter woolies when spring has already sprung, it might as well be something you totally completely love. 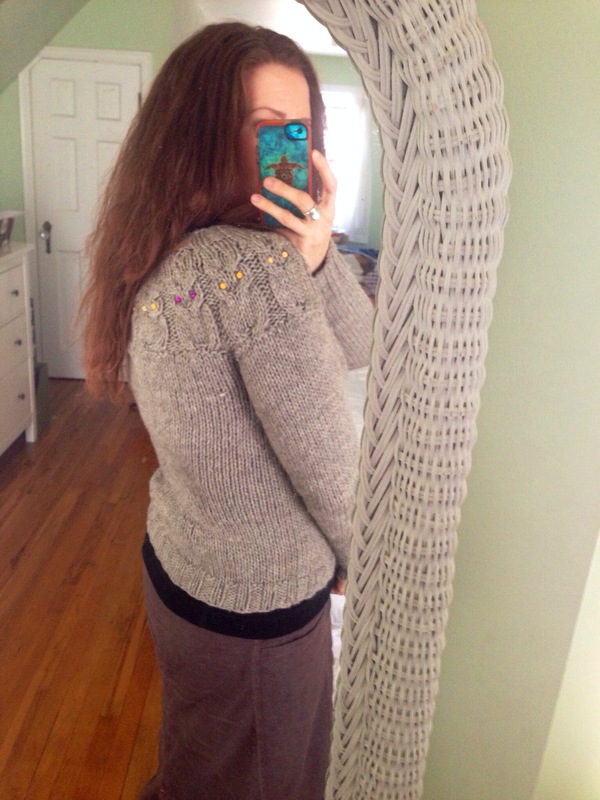 I made this owls pullover back in the fall of 2009, and I still love it to pieces. They look pink in this pic, but they really are purple – I should have included this handknit in my recent roundup of my obsession with purple+gold. I tend to gravitate towards making raglan sweaters, but I’ve realized lately that I really, really like wearing yoked sweaters. I think the only yoked sweaters I’ve made for myself are this one and Zelkova, and now I’m wondering why, because both Owls and Zelkova are two of my very favorite sweaters. Which kind of sweater do you tend to want to knit – raglan, yoked, set-in sleeves? And which do you think is most flattering on you? 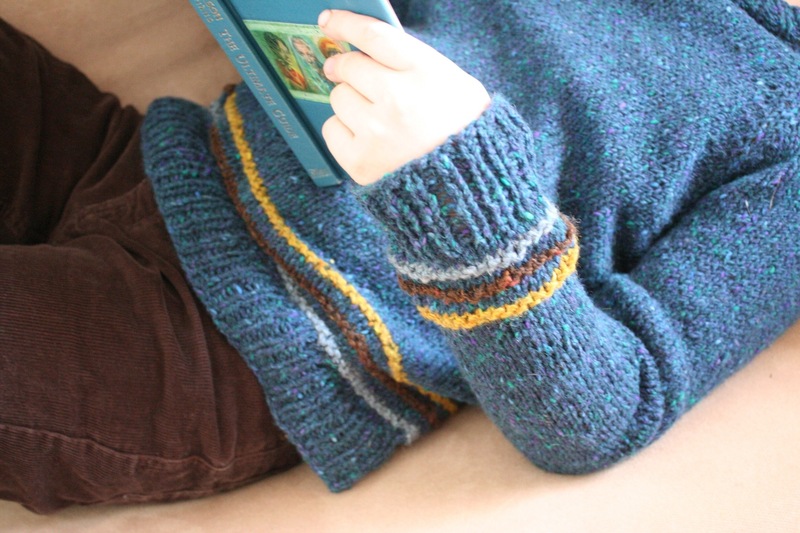 I had a vision in the fall, of coordinated sweaters for both my boys, knit in the same season. It was a lofty goal, one I’ve never managed to achieve, and it was made even loftier by the fact that I secretly hoped I would also be able to make a coordinated sweater for their father. Stop laughing, y’all! I can’t help it – I clearly just don’t understand how the time-space continuum works. I cast on for a sweater for Tiny Dancer in September, but then got buried in other knitting commitments. 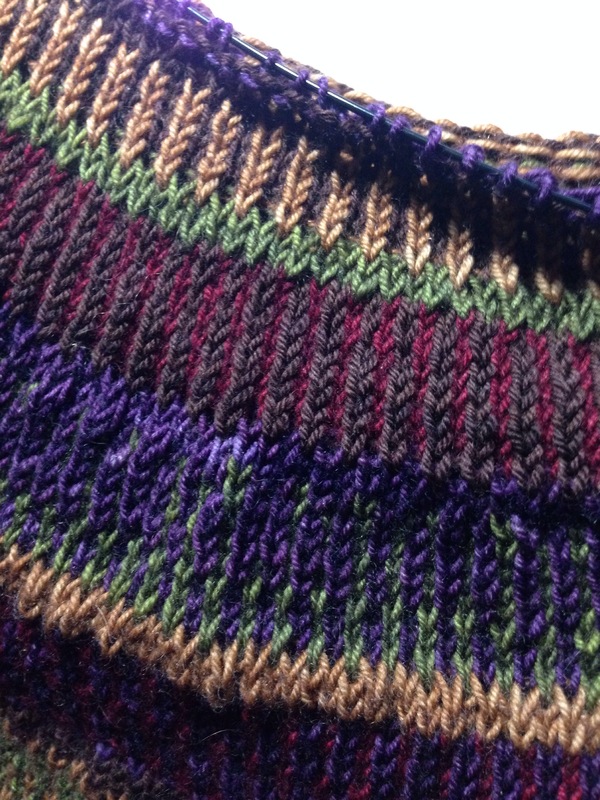 After Thanksgiving, I got back to it, finished the body – and realized I was very displeased with my colorwork. In addition to the fact that my tension went wonky, I also decided that my original vision for the sweater was a bit too busy for my kiddo. After Christmas, I finally ripped it back and redid, opting for a much subtler bit of color. 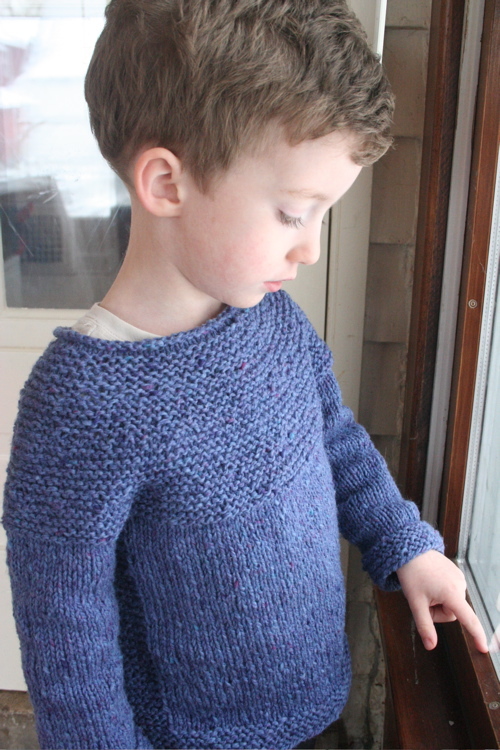 The end result is a pretty minimalist sweater design, which suits my little dude just great. It’s an extremely simple, straightforward design – just a top-down raglan, with 1×1 ribbing on the neck, waist, and cuffs, with three garter stripes at the waist and above the cuffs. 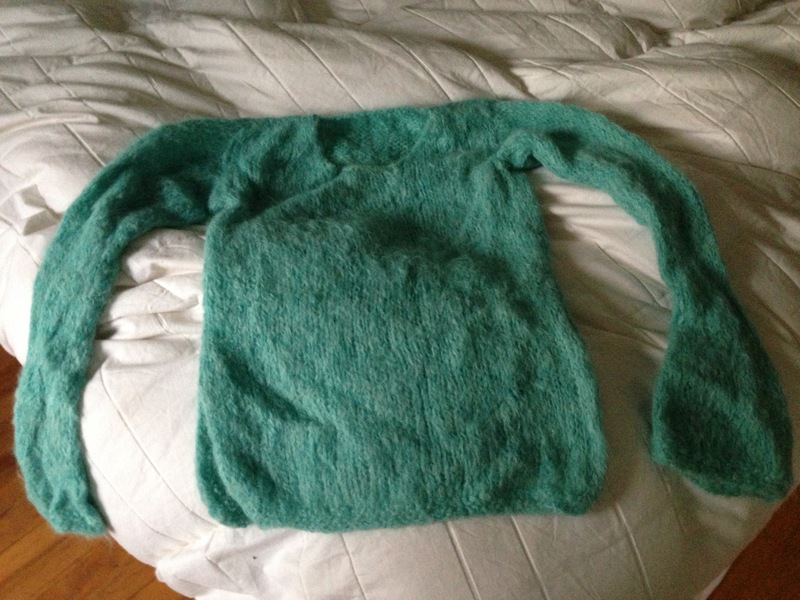 It’s kind of silly that it took me so long to knit what is basically the simplest sweater in the world. I love this yarn to pieces and still mourn the fact that it was discontinued almost as soon as I discovered it. This is Plymouth Tweed, the same yarn I made my Allegheny Dress out of (in fact, the golden stripe is leftover yarn from my dress). I stocked up on a variety of colors on closeout in the fall of 2011, with hopes of eventually knitting sweaters for the whole family. Yes, I’ve had this dream for awhile it seems. 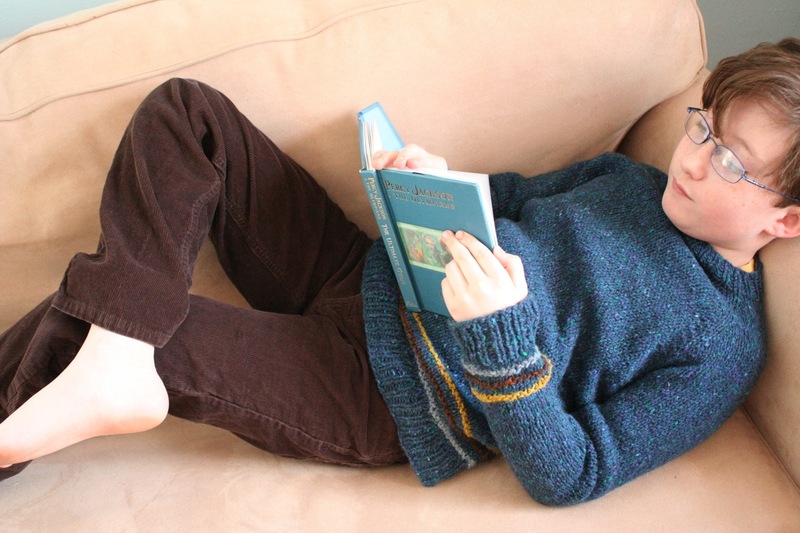 This tweedy sweater reminds me a bit of another sweater I once made him, and I couldn’t resist comparison shots. How is this kid a tween already? I mean, perhaps nine isn’t really officially tweendom, but he’s on the verge of ten now, and trust me – the tweenish behaviors are all there. In fact, even though I think this sweater looks really good on him, I wouldn’t be at all surprised if he finds it too embarrassing now to wear a sweater his mom made for him. That sweater was knit in Cascade Elite Skye Tweed, which was also discontinued, and which I also bought a bunch of on closeout, also with a never-realized dream of coordinating sweaters for the whole fam. Ah, the kids grow up, but some things never change. Given how long this winter seems to be going on here in Michigan, perhaps I can still get a sweater knit for his brother before things warm up? 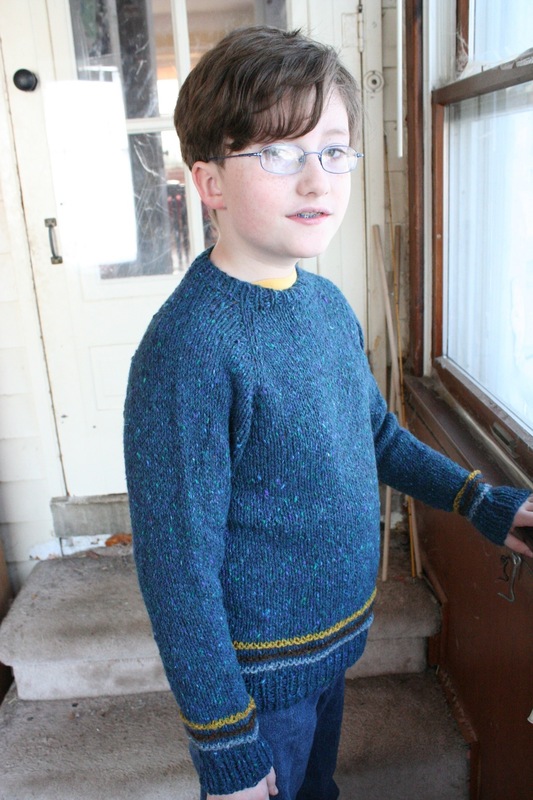 In the fall, I set a goal of knitting sweaters for both my sons – a feat I have never before accomplished in one season. 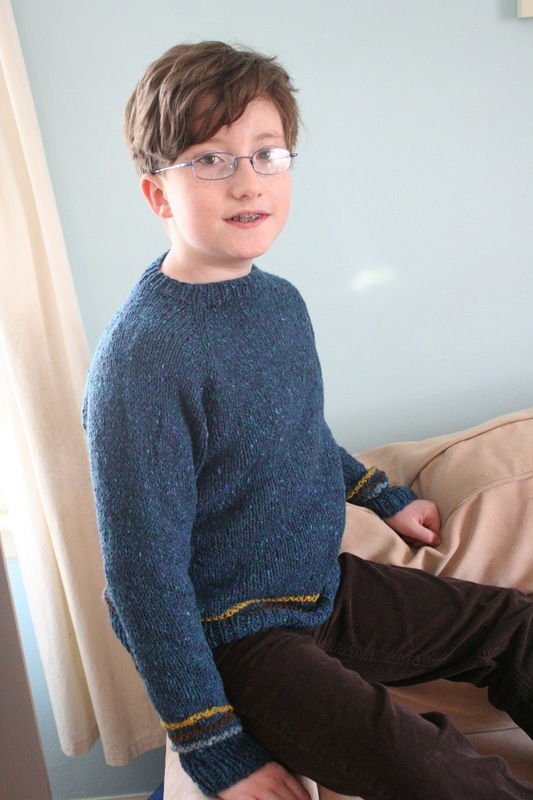 Usually, I am doing well to get a sweater knit for one son before he outgrows it. I was determined this time to knit sweaters for both of them, in time for them to both wear them before winter was up. Given my track record, this was an ambitious goal. I made it even more so by setting out to design the sweaters, too. My vision was of coordinated colorwork sweaters for all three fellas in my family (thank goodness there is no risk of My Old Man outgrowing his before I can finish it). You know, a sweater for a kid, even a bigger kid, which mine now are, really shouldn’t take more than three weeks to complete. Of course, that would require not setting it aside multiple times for multiple other projects, which is what I’ve done. Also, it would mean not involving all the trial-and-error work original designs involve (at least that’s what they involve for me). 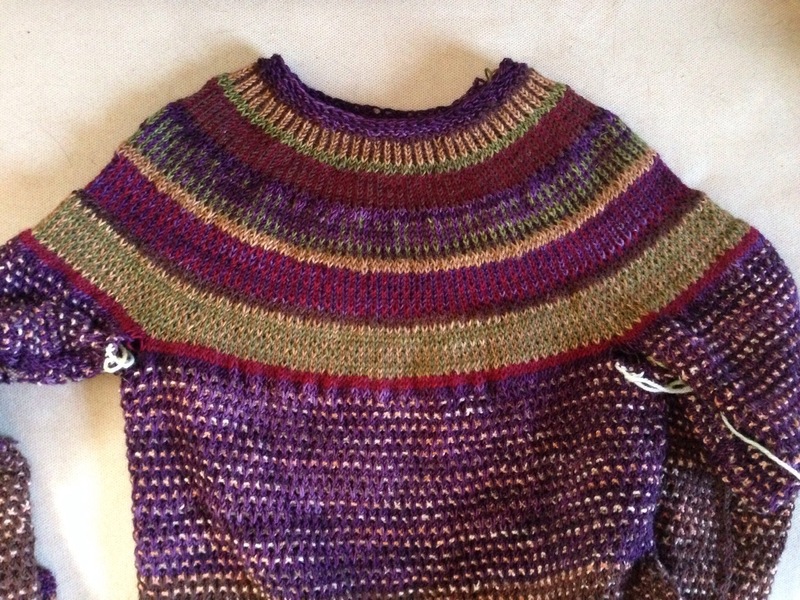 I finished the body of Tiny Dancer’s sweater in November, but I was horrified with the result of the colorwork. 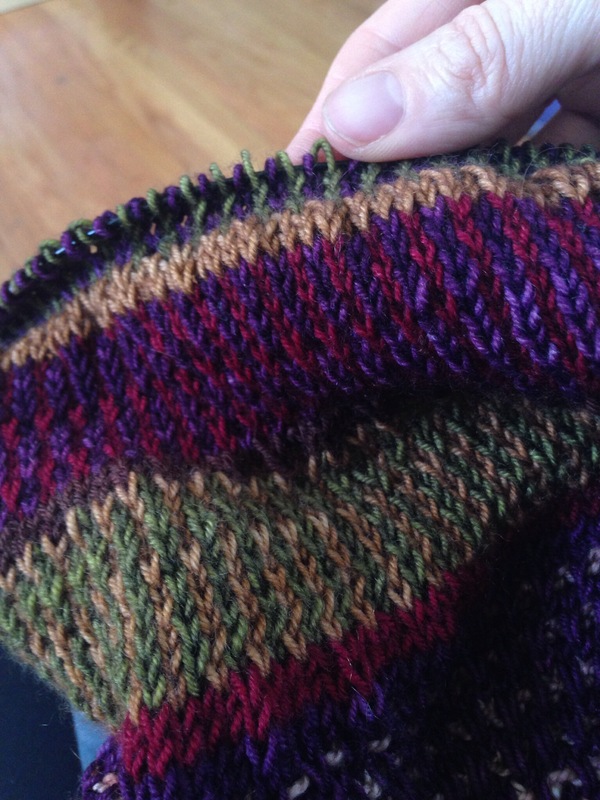 For one thing, I should’ve gone up a couple of needle sizes to accommodate for my tighter gauge when knitting stranded – I knew it was bad, but didn’t realize how bad it was until he tried it on. I also decided it was busier than I wanted it to be (though not nearly as busy as colorwork can be). And though I usually love corrugated ribbing, I hated it on this sweater. I also decided I wasn’t super-wild about the lime green (which will be the main color of Little Buddha’s sweater, and was picked by him). I like the color itself, but wasn’t loving it in combination with the other colors (it is also a different yarn than the tweed I’m using in the rest of the sweater). As sometimes happens with crafting fails, the result was procrastination – I couldn’t quite make myself unknit and reknit. I set it aside after Thanksgiving and didn’t pick it back up until sometime last month. I’ve changed the colorwork completely, opting for subtle garter stripes instead, and I still had some trial-and-error with the sleeve fitting, but at long, LONG last, I am finally done. Well, except for the weaving in and blocking. And except for the fact that I have a whole other kid to knit a sweater for and only a few more weeks of winter left. Theoretically…. After three days of a house full, including 11 people for Thanksgiving dinner (and for dinner the night before), the house now feels strangely empty and quiet (even though there are still four of us here). As I mentioned earlier this week, I do not participate in the madness of Black Friday. I am fully onboard with PoMoGoLightly’s call for today to be Craft Friday. I have a ton of craft plans for December (natch) and the list has suddenly gotten much longer, with several family members requesting special handknit Christmas gifts. I’m happy that people want handknits and I’m going to do my best, but my first order of business is to finish a pair of sweaters for my kiddos. This one is for Tiny Dancer and I’m pleased with how it’s turning out. I’m devoting Craft Friday to this (plus a little spinning), and I hope to finish it soon. What are the chances I can knit one for Little Buddha and still get all my Christmas knitting done? And how about you? What are your Craft Friday plans? And I’d never even worn it. It made me look like a lump. I seamed the armholes too tight. 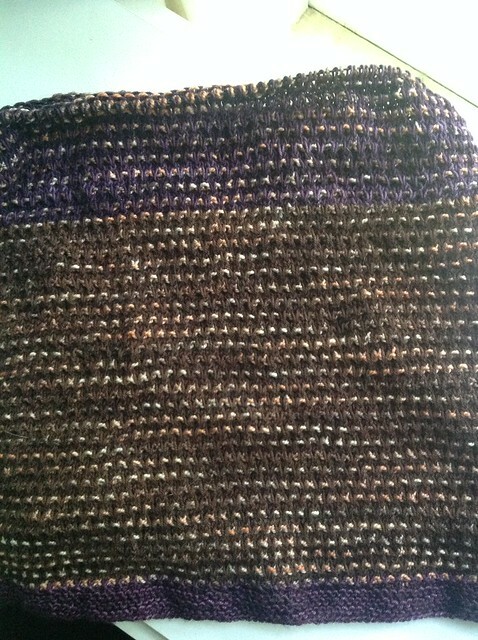 I could’ve undone and redone the armholes (though in this particular yarn that would’ve been a HUGE pain). But it simply wasn’t worth it for a sweater that was so entirely unflattering on me. I thought that some day I might turn into a waif and the sweater would suddenly look great on me. I thought I might frog the sweater and repurpose the yarn. I hate throwing things away. I’m running out of places to store the handknits I actually like and wear, so I finally got over these obstacles. I decided not to bother trying to pass this thing off to anyone else – the sleeve seams are just too tight (at least for anyone for whom the body would fit) and the yarn just isn’t worth recycling. I didn’t enjoy knitting with it the first time, why would I (or anyone else) want to knit with it after it had been unknit? So I tossed it. This represents progress for me. I hate to throw things away because I always figure that I (or someone else) will have a use for them some day. Of course the real progress would be if I could always keep in mind that I am not, in fact, a waif, and should never knit patterns just because they look great on waif-like models. What about you? 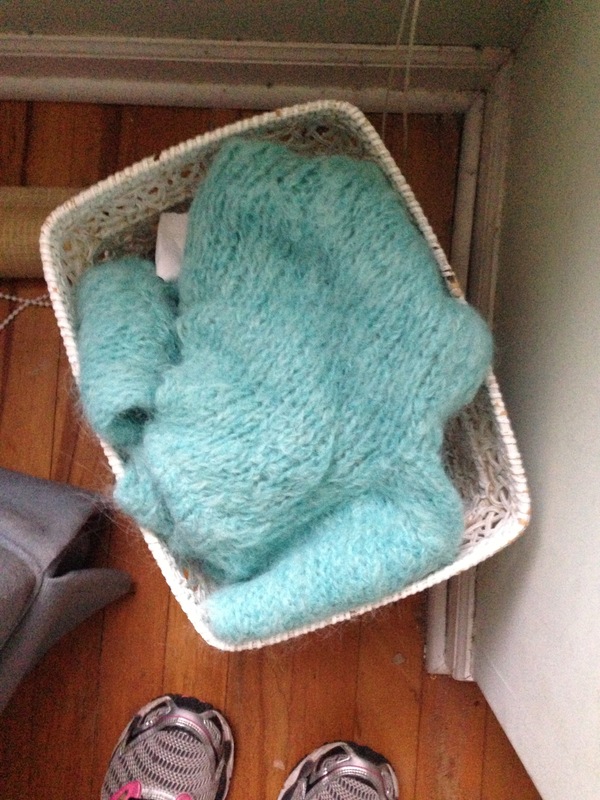 Ever thrown away a hand knit?